v.net.iso - Splits net by cost isolines. Splits net to bands between cost isolines (direction from center). Center node must be opened (costs >= 0). Costs of center node are used in calculation. v.net.iso splits a network into bands between cost isolines (distance from center). Center nodes must be opened (costs >= 0). The costs of center nodes are used in the calculation. Nodes must be on the isolines. The map must contain at least one center (point) on the vector network which can be patched into with v.net. 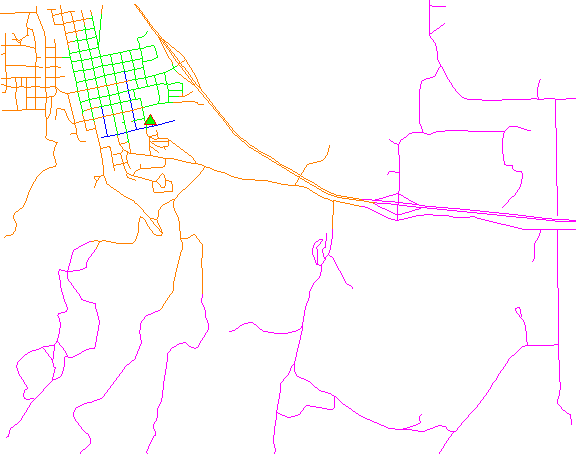 v.db.addtable myroads_net_iso_time columns="cat integer,trav_time varchar(20),GRASSRGB varchar(11)"
v.db.update map=myroads_net_iso_time layer=1 column=trav_time value="0 - 1" where="cat = 1"
v.db.update map=myroads_net_iso_time layer=1 column=trav_time value="1 - 2" where="cat = 2"
v.db.update map=myroads_net_iso_time layer=1 column=trav_time value="2 - 5" where="cat = 3"
v.db.update map=myroads_net_iso_time layer=1 column=trav_time value="> 5" where="cat = 4"
v.db.update map=myroads_net_iso_time layer=1 column=GRASSRGB value="000:000:255" where="cat = 1"
v.db.update map=myroads_net_iso_time layer=1 column=GRASSRGB value="000:255:000" where="cat = 2"
v.db.update map=myroads_net_iso_time layer=1 column=GRASSRGB value="255:128:000" where="cat = 3"
v.db.update map=myroads_net_iso_time layer=1 column=GRASSRGB value="255:000:255" where="cat = 4"